MR. HEALY: Sir, with the exception of a few witnesses who will be dealing with aspects of the Terms of Reference concerned with Mr. Haughey, the evidence to be led at these sittings will take up where the Tribunal adjourned last July. The Tribunal had hoped to reconvene to deal with these matters at some point in the latter part of September, but due to difficulties in arranging for attendance of witnesses, the sittings have had to be put back. During the adjourned sittings, evidence was given concerning a number of financial transactions with which certain individuals were associated, and as I indicated in the last two Opening Statements, what the Tribunal was seeking to do was to examine the connections between those financial transactions and the individuals associated or connected with them in the context of those Terms of Reference dealing with payments to Mr. Lowry. In other words, the evidence was concerned with the money trail so far as it concerned Mr. Lowry and the Tribunal’s Terms of Reference. Although these sittings will take up where the July sittings adjourned, some new information has come to hand, and I think it would be useful if that information was put into context in terms of evidence that has already been led concerning these matters since, I think, sometime in late June. I want to deal firstly with the $50,000 Telenor/ESAT payment to Fine Gael. It will be recalled that the first witness to give evidence in relation to this matter was Mr. Arve Johansen, an executive of Telenor. In the course of his evidence, Mr. Johansen indicated that there were certain matters which he felt were covered by legal privilege and to which he did not wish to refer in the course of his evidence. The question of legal privilege arose in connection with a number of meetings held at the end of October and the beginning of November of 1997. Now, as we know from the evidence that was led, mainly in July, the $50,000 payment to Fine Gael was discussed fairly extensively at those meetings. The meetings were concerned with the impact that this payment might have and the impact that the disclosure of the nature of the payment might have on the then imminent IPO or public flotation of ESAT Telecom. ESAT Telecom is of course Mr. O’Brien’s vehicle and was the entity through which his shareholding in ESAT Digifone was held. Around that time, in October and November of 1997, there were other communications, that is to say, communications which did not occur in the course of formal meetings, and these also raised questions of privilege. As we know, most of these difficulties concerning privilege have now been resolved. 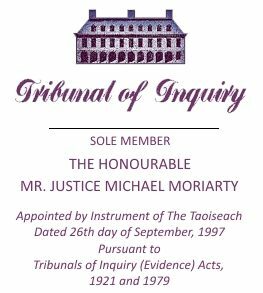 The Tribunal has had access to most of the documentary material, most of the solicitors’ records and other records and minutes concerning these meetings, and that material has been mentioned extensively in the course of evidence given by other witnesses who were in attendance at those meetings, including, for instance, Mr. O’Brien, Mr. Barry Maloney, Mr. Dermot Desmond, Mr. Fortune, Mr. Callaghan, Mr. Leslie Buckley, and so on. Mr. Johansen will now have to be re-examined and some of the evidence he has already given will have to be revisited in the context of the records of those meetings and of course, in the context of evidence given by other individuals concerning what transpired at those meetings and concerning what is contained in the records of those meetings. Mr. Johansen, in a number of statements made available to the Tribunal prior to its adjournment and also in September of this year, deals with further aspects of the $50,000 payment to Fine Gael and certain aspects of the evidence given concerning statements made by Mr. Denis O’Brien to Mr. Barry Maloney, that he, Mr. Denis O’Brien, had paid £100,000 to Mr. Michael Lowry and £100,000 to another unnamed person. I want to deal firstly with the $50,000 payment to Fine Gael. Mr. Johannson provided the Tribunal with a statement of the 11th June, 2001; this was after he had given evidence. That statement was provided in response to queries from the Tribunal concerning the shredding of Invoice Number 1000050, dated 11th January, 1996, for 316,000 Norwegian kronar. This was the invoice raised by Telenor and with which you will be familiar in respect of the payment of US $50,000 to Mr. David Austin by way of a contribution to Fine Gael. Mr. Johannson informed the Tribunal, in that statement of the 11th June, that he had instructed inquiries to be made of Mr. Jan Edward Thygesen, who was the Chief Executive of ESAT Digifone from early November 1995 to the 19th February of 1996, with a view to ascertaining what information Mr. Thygesen had concerning the invoice. According to Mr. Johannson, and based on the information he had obtained, Mr. Thygesen was not involved in matters relating to the accounts. He went on to state that Mr. Thygesen had informed him that he was not aware of any Telenor seconded employee to ESAT Digifone being involved in the processing of invoices to ESAT Digifone and that, to the best of his knowledge, the invoice would have been processed in the accounts department of ESAT Digifone, which was then managed by Mr. Peter O’Donoghue, the then Chief Financial Officer of ESAT Digifone. In his 11th June, 2001, statement, Mr. Johansen also referred to information relayed to him by Mr. Per Simonsen. It will be recalled that Mr. Simonsen’s name had appeared on one of the invoices and that evidence had been given by Mr. Johansen concerning Mr. Simonsen’s role in the matter. In his statement of the 11th June, 2001, Mr. Johansen informed the Tribunal that having brought the matter up with Mr. Simonsen, he was informed that Mr. Simonsen had not communicated with Mr. Thygesen in relation to the invoice and that he corroborated Mr. Thygesen’s statement in relation to it. At that stage, no further significant information was provided by Telenor or Mr. Johansen concerning the processing of invoices in the account between Telenor and ESAT Digifone. In his 11th June, 2001, statement, Mr. Johansen also referred to evidence given by Mr. Denis O’Brien concerning discussions which took place between Telenor and ESAT Digifone in the period April and May of 1996 regarding the reimbursement of Telenor by ESAT in respect of this payment of US $50,000. Mr. Johansen informed the Tribunal that having taken up the matter with members of the Telenor negotiating team, Mr. Rolf Busch and Mr. Arthur Moran, solicitor, he believed that the matter had never been in issue in the negotiation of the Shareholders’ Agreement, and that was what the parties were involved in in April/May of 1996. And he goes on to say that he believes that there had been no suggestion, as had been asserted by Mr. O’Brien in evidence, that ESAT had been compelled or pressurised into reimbursing Telenor for the $50,000 payment. Mr. Johansen has now provided the Tribunal with a further statement, dated 18th September, 2001, dealing with other aspects of the circumstances in which the various different invoices concerning this $50,000 payment were raised by Telenor. He has informed the Tribunal that his September statement deals with matters that he had been reminded of by Mr. Knut Digerud. Mr. Digerud is no longer an employee of Telenor, and according to Mr. Johansen, it had not been open to him to take the matter up with Mr. Digerud in or around the month of June at the time of his earlier statements. In his September statement, he has referred the Tribunal, once again, to a letter from Mr. David Austin dated 14th December, 1995, addressed to him at Telenor and enclosing an invoice of the same date for consultancy work for 1995. You will recall that this was the invoice that was generated for the purpose of enabling Telenor to make the payment. Mr. Johansen has already given evidence that he received this letter and invoice in or around the 18th or 19th December. He has now informed the Tribunal that having received the letter and the invoice, he showed them to Mr. Digerud and explained what they were. . At the time, he and Mr. Digerud were preparing for a board meeting of ESAT Digifone to be held in Dublin on the following day. He put the letter and the invoice in his briefcase to bring them with him to Dublin in order to show them to Mr. O’Brien for Mr. O’Brien’s approval. He has also, in his recent statement, informed the Tribunal that at some point shortly before or during a break in the board meeting, he had a discussion with Mr. O’Brien in the room in which the board meeting was being held and that Mr. Digerud was present, although he did not participate in the discussion. During the discussion, he says that he showed Mr. O’Brien the original letter and invoice that he had received from Mr. Austin, and he says that he informed Mr. O’Brien that he would arrange for Telenor to facilitate the payment of $50,000. Mr. O’Brien made no reference to any such meeting in the course of his evidence. It is of course fair to say that Mr. Johansen made no reference to any such meeting in the course of his evidence either, and it is also only fair to point out that the matter could not have been drawn to Mr. O’Brien’s attention by the Tribunal, as the Tribunal had not, at the time of Mr. O’Brien’s evidence, been made aware of the information which has now been provided by Mr. Johannson. Mr. Johansen has stated that he informed Mr. O’Brien that Telenor would make the payment and that they would then invoice Digifone for an equivalent sum; that Mr. Johansen handed Mr. Digerud the David Austin invoice and letter and asked him to arrange to process the payment and to arrange for the reimbursement. While the Tribunal initially had some difficulty in locating Mr. Digerud, he has now been located, with the assistance of Telenor, and he has provided the Tribunal with a statement. His statement deals with his knowledge of the circumstances in which Telenor agreed to make the payment in the first place, and also his knowledge of the manner in which the invoices were raised and his knowledge, such as it is, of the shredding of the invoices. He has informed the Tribunal that he remembers that Mr. Denis O’Brien was in the offices of Telenor in Oslo on the 8th December, 1995, and that on that date, he, Mr. O’Brien, requested a private meeting with Mr. Johannson. Mr. Digerud says that after the private meeting, Mr. Johansen confirmed to him that he had agreed, at the request of Mr. O’Brien, that Telenor would facilitate a political donation to a political party in Ireland, but he cannot remember if the name of the political party was mentioned at that time. He was informed that although Telenor would fund the donation, it would be reimbursed by Digifone. He was told that these arrangements were being made so as to enable the donation to be kept confidential in Ireland. He has already informed the Tribunal that he was with Mr. Johansen in his office in Oslo on the afternoon or evening of the 19th December, 1995, preparing for the board meeting of Digifone to be held in Dublin on the following day. He says that Mr. Johansen showed him two documents at that time, namely, the letter from Mr. David Austin dated 14th December, 1995 and the invoice of the same date. He says that he also recalls that during the board meeting in Dublin, Mr. Johansen showed the letter and invoice to Mr. O’Brien, and that while he did not participate in the discussion between Mr. O’Brien and Mr. Johansen, he recalls that after the discussion, Mr. Johansen handed the documents to him with instructions to process the payment and the reimbursement. He has informed the Tribunal that he wrote an instruction in Norwegian on the original letter approving the invoice and directing Mr. Per Simonsen, the project manager of the ESAT Digifone project, as to what should be done. From his statement, it would appear that he had no further involvement in the processing of the payment or in the generating of the various invoices culminating in the final invoice dated 27th March, 1996, which was issued in Irish pounds — some 33,000 Irish pounds. Mr. Johansen, in the more recent statements he has provided to the Tribunal, that is to say in the statements he has provided since he last gave evidence, has also dealt with the assertion by Mr. Denis O’Brien that he had made two payments of £100,000, one of which was made to Mr. Michael Lowry. Mr. Johansen has informed the Tribunal, and it will be recalled that he was not able to deal with these matters in the course of his evidence, but he has informed the Tribunal that, while he can not be certain, he believes that the first he heard of these statements by Mr. O’Brien was prior to a board meeting of ESAT Digifone on the 30th October of 1997. When the matter was brought to his attention, Mr. Johansen consulted with Mr. Digerud, and they were both concerned at the fact that the public flotation was proceeding, notwithstanding the existence of a matter which they considered to be of an extremely serious nature if it were shown to be true. They were particularly concerned that there was insufficient time within which to conduct an adequate inquiry, and it would appear that, at that time, Mr. Digerud felt that the IPO should have been suspended immediately. Mr. Johansen will now be in a position to give evidence concerning the various records of the meetings which took place in October and November of 1997, but to which he felt he was unable to refer when he was last giving evidence because of questions of legal privilege which have now mainly been resolved. I now want to deal with another matter which was mentioned in evidence before the Summer, and in relation to which further information has come to hand. This information concerns share transactions involving Mr. Denis O’Brien and the late Mr. David Austin. It will be recalled that Mr. O’Brien gave evidence that he had been anxious to make provision for the late Mr. Austin as part of the Friends and Family Scheme operated at the time of the ESAT Telecom flotation. He informed the Tribunal that, due to an oversight, he had omitted to make his planned provision for Mr. Austin at the time of the flotation, and it was not until February of 1998, some four months later, that he actually attended to the matter. The shares in question were made available to Mr. Austin for the sum of $100,000. In February of 1998, Mr. O’Brien had to pay some $150,000 in order to buy the shares. However, because they would have been available to Mr. Austin at a discount as part of the Friends and Family Scheme, Mr. O’Brien funded the $50,000 differential between what the shares would have been available at at the time of the flotation and what they cost to purchase on the market in February of 1998. This was one of the share transactions involving Mr. O’Brien and Mr. Austin in relation to which evidence was given before the Summer. But Mr. O’Brien also gave evidence concerning another share transaction which also appeared to involve Mr. Austin. This transaction involved share dealings which occurred in the latter part of 1998, that is to say, not in February, but towards the end of the year. Mr. O’Brien gave evidence regarding the purchase of some 12,000 ESAT Telecom shares in September of 1998. These shares were purchased through Donaldson Lufkin & Jenrette, a US firm associated with Credit Suisse First Boston. This firm has been mentioned in evidence already and is sometimes referred to as DLJ. It was centrally involved in the public flotation of ESAT Telcom. It appears that the 12,000 shares were purchased for the account of Mr. David Austin. Mr. O’Brien gave evidence that the shares were in fact intended for the account of Mr. Noel Walshe, Mr. O’Brien’s father-in-law. I am not sure whether he mentioned Mr. Walshe’s name at the time, but that would have been in ease of Mr. Walsh. I am not suggesting that Mr. O’Brien was in any way trying to conceal the fact that the shares were, as he put it, intended for the account of Mr. Noel Walsh. Mr. O’Brien was saying that although the shares had been purchased in the name of Mr. Austin, this purchase was made in Mr. Austin’s name in error. In evidence, Mr. O’Brien was uncertain as to whether this error occurred on the part of DLJ or on the part of Mr. Aidan Phelan, by whom, according to Mr. O’Brien, the funds were arranged to meet the purchase. In the course of giving evidence concerning this matter, Mr. Aidan Phelan stated that he had arranged for the funds to be provided to finance the share purchase, but that it was his understanding that the shares had been purchased on the account of the late Mr. Austin, and what is more, that he would have confirmed with Mr. O’Brien that the purchase was to be in Mr. Austin’s name. Mr. O’Brien has given evidence that subsequently, in order to rectify the error, the shares were transferred from Mr. Austin’s account to Mr. Walsh’s account. In evidence, Mr. Phelan indicated that neither he nor any of his co-executors of the estate of the late Mr. Austin, nor Mr. Walter Beatty, solicitor to the estate, gave any instructions to transfer these shares out of the late Mr. Austin’s account. However, documents have just recently come to light suggesting that Mr. Phelan may have had an involvement, although it is not clear that he was aware that there had been an error as such. We refer to your letters of June 28th and August 21st. 1. “The holding of 12,000 ESAT shares remained in David Austin’s account until November 16th, 1998, when we received a letter of authorisation (copy enclosed, dated October 13th, 1998) from David Austin to transfer the shares to the account for which they were originally intended. 2. “The documents we sent are the record of all transactions on Mr. Austin’s account, including share dealings, share transfers and receipt/disbursement of funds and do not show supporting documentation authorising transfers on the account. When an error is discovered in an account, and particularly if some period of time has elapsed, we request a letter of authorisation from the account holder (copy enclosed) to permit us to rectify the error by transferring the shares to the proper account. 3. “As requested, we enclose copies of all documents held by DLJ in relation to the late Mr. Austin’s account including all share dealings on the account, including the transfer of any shares into or out of the account, the receipt of funds on the account and the receipt of any instructions by or on behalf of Mr. Austin in relation to all share dealings. Now, DLJ provided the Estate of Mr. Austin, as part of their response to the queries raised by Mr. Walter Beatty, with a number of documents, two of which only I want to refer at this stage. They concern Mr. Austin’s share transactions on his account in October/November of 1998. Then there is a number in manuscript of that account. Now, I think at the top of that document, on the right-hand side, is a manuscript which appears to read “Done,” then seems to be either “5/18” or “5118” — it’s not clear. The Tribunal is making inquiries into what this manuscript means. Although the word “Done” appears on the top right-hand corner of this letter, the Tribunal has not yet been able to establish whether this instruction was in fact carried through, or if it was, whether it was carried through at the time. Because it appears that the executors of the Estate of the late David Austin were under the impression, at the time of the swearing of the Inland Revenue affidavit in his Estate, that the instruction had not been carried through. This is because the Inland Revenue affidavit, containing a statement of the late Mr. Austin’s assets at the time of his death, included the shares in question. What is important to bear in mind in relation to this correspondence and the swearing of this Inland Revenue affidavit is that Mr. Austin died on the 1st November, 1998. “Re Esat Telecom Group, plc. Now, it would appear from the letter to which I referred a moment ago from DLJ, the letter from Mr. Muldowney, that Mr. Austin’s letter of the 13th October, 1998, addressed to Mr. Phelan, did not reach DLJ until November 16th, 1998; and as I have said, by that date, Mr. Austin had been dead for some two weeks. And of course, by that stage, one assumes that only his Estate could have given instructions in relation to his affairs. These additional documents have now been brought to the attention of Mr. Phelan in light of his earlier evidence, and he has informed the Tribunal that he has no recall in relation to receiving the letter of the 13th October, but that his office was used by David Austin as a mailing address for DLJ correspondence, and it is his belief that the letter of the 13th October, addressed to his office, was passed on to DLJ by his secretary. The task for the Tribunal is to endeavour, so far as this is practicable, to establish the true nature of the transactions involving the 12,000 shares and to endeavour to establish whether, in the light of the apparent conflict between Mr. O’Brien’s evidence and Mr. Phelan’s evidence, the purchase of these shares in Mr. Austin’s name was in fact an error. On its face, the share transaction resulted in a benefit to Mr. Austin of some $300,000, approximately. If the transaction was not in fact an erroneous one, the question which arises is as to what was intended by conferring a benefit of this kind on Mr. Austin and whether there are any other connections between such a transaction and other payments to Mr. Austin which appear to have links to Mr. Lowry. This transaction, or if you like, these two transactions, will be examined as part of the exercise mentioned by the Tribunal at the outset of this part of its inquiry involving the scrutiny of connections between a number of transactions, various individuals and their related associations with Mr. Lowry. Mr. Lowry’s blanket denial of any such connection should be borne in mind, having regard to the fact that he has yet to give evidence to the Tribunal concerning these matters. Now I want to shortly or briefly mention two others matters concerning firstly the evidence of Ms. Helen Malone, and secondly the dealings the Tribunal has had with Irish Nationwide (Isle of Man). Ms. Helen Malone has provided the Tribunal with a statement concerning her involvement in some of the financial transactions already mentioned in evidence at the Tribunal sittings. Ms. Malone is currently a partner of Mr. Aidan Phelan in the firm AP Consulting. While Ms. Malone appears to have had a role in the Mansfield transaction, in what is known as the Cheadle transaction, in the transfer of the ownership of a property owned by Mr. David Austin to Mr. Denis O’Brien, and in assisting Mr. Austin to open an account in DLJ for the purpose of holding his shares in ESAT Telecom from her statement, it would appear that she acted on instructions in relation to most of these matters, she appears, again from her statement, not to have been aware of the totality of the arrangements between the various individuals involved. Now, I want to come to a matter concerning Irish Nationwide (Isle of Man). Irish Nationwide (Isle of Man) is a financial institution wholly owned by the Irish Nationwide Building Society in this jurisdiction. It would appear from evidence given at the Tribunal’s last sittings that in fact, most of the assets of Irish Nationwide (Isle of Man) are invested in the Irish Nationwide Building Society in Dublin. Irish Nationwide (Isle of Man) is an offshore financial institution in which Mr. Michael Lowry had an account from some time in late 1996. It is the account into which Mr. David Austin paid the sum of £147,000 for Mr. Lowry’s benefit. Mr. Lowry has asserted that that payment was of course by way of a loan, and furthermore has asserted that it was paid back to Mr. Austin in February of 1997. The Tribunal has been in correspondence with Irish Nationwide (Isle of Man) in an effort to obtain information concerning the account opened by Mr. Austin and the dealings that both Mr. Austin and Mr. Lowry had with that financial institution. The Tribunal has obtained a waiver of confidentiality from Mr. Lowry to enable the bank to deal with queries from the Tribunal; in other words, to relieve the bank of any duty of confidentiality they might have to their client which would prevent them from assisting the Tribunal. The Tribunal also obtained from the Estate of the late Mr. David Austin a waiver of confidentiality, to enable the bank to respond to queries and again, so as to avoid the bank having to act in breach of any duty of confidentiality it might have owed to Mr. Austin or to the Estate of Mr. Austin. The bank provided the Tribunal with certain documentation and responded to certain queries concerning the account, but the Tribunal was anxious to obtain the evidence of officials of the bank who had dealt with the opening of the account, who had dealt with Mr. Lowry’s affairs, and who may have dealt with Mr. Austin. Because of the centrality of this transaction, the opening of this account and the payment of this large sum of money into the account in the Tribunal’s current inquiries, it was important that evidence would actually be given by these officials concerning these matters and that they would not merely provide the Tribunal with documentation, but that they would provide the Tribunal with information, and that that information would be available in the form of evidence — testimony, in other words — at the Tribunal sittings. Now, I should say that the Tribunal has dealt with other foreign-based financial institutions, and where the relevant waivers were provided, those foreign-based financial institutions, or at least some of them, have provided the Tribunal with assistance, and it will be recalled, as in the case of Investec, provided the Tribunal with evidence, the evidence of witnesses who, because they were outside the jurisdiction, could not otherwise be compelled under process of law to appear as witnesses. It is well-known that the Tribunal has had difficulty in obtaining even documents, not to mention testimony, from offshore banks; in particular, from the Ansbacher Cayman Bank. At the last sittings of the Tribunal, Mr. Michael Fingleton gave evidence, and in the course of his evidence, he was asked to explain, so far as he could, the difficulties the Isle of Man financial institutions had in providing witnesses to the Tribunal. It will be recalled that Mr. Fingleton is the managing director of the Irish Nationwide Building Society, and he is also a director of the Isle of Man company. He was asked: “Is there anything you know that would –” and his response was “No.” I think Mr. Coughlan was questioning him, and went on to say “That would preclude them?” And he said “Absolutely not.” He was then thanked for his evidence. In the course of that evidence, Mr. Fingleton also indicated that there were many questions concerning the Isle of Man bank that he was not able to respond to, but he indicated that there was a witness who would give evidence and would be able to answer those questions. And he named Mr. Crellin, an official of the Isle of Man bank. Mr. Crellin is in fact the Chairman of the Isle of Man bank. Now, Mr. Crellin has indicated to the Tribunal that he is prepared to give evidence, but his availability does not mean that he will be able to give evidence at this time, and it is highly unlikely that the Tribunal will be dealing with these matters when he becomes available. If, in due course, it seems convenient to take his evidence when he becomes available, the Tribunal will do so, but the Tribunal obviously cannot wait around until Mr. Crellin is available in order to deal with these matters. In that letter he had indicated he would be away on holiday for the whole of October but that he felt that a date in the second half of November or early December could be arranged to the convenience of the Tribunal and himself. The Tribunal indicated that it was not in a position to agree a date as remote as that and that it wouldn’t be convenient. Mr. Duncan Jones goes on: “We totally refute the suggestion that we have refused to cooperate with the Tribunal. We have discharged fully our obligations under Mr. Lowry’s authorisation. The Tribunal has received copies of all our records relating to Mr. Lowry’s account, and all your questions have been voluntarily answered in writing. “And this is clearly where the media were totally misled. These comments are all the more serious due to the fact that they were attributed to the lawyers of the Moriarty Tribunal and were consistent with the statement made by the Tribunal on page 39 of the transcript referred to above. “We would now ask you once again to withdraw those statements, as they were factally incorrect and to redress the damage clearly done to both the bank and our parent. Mr. Davis responded by letter of the 9th October, 2001: “Dear Mr. Jones: I refer to your letter of the 5th October, 2001. “You may rest assured that the Tribunal will arrange that the entire contents of your letter under reply will be read into the record of the Tribunal sittings. “I note that you have not indicated in your letter under reply that there is any provision of the laws of the Isle of Man which would preclude your bank from assisting the Tribunal by making available officials of the bank to give evidence or to assist the Tribunal with information. 1. Whether (as I have requested in an earlier letter) your bank is prepared to allow officials of the bank to give evidence to the Tribunal and to assist the Tribunal with information. 2. Whether your bank has precluded any of its officials from attending the Tribunal to give information in connection with the accounts of Mr. Lowry and the late Mr. Austin, both of whom have provided you with the appropriate authorisations to do so. The Tribunal has not received any response to that letter, and the position as of this moment is that while the bank has indicated that it will provide the Tribunal with documentation, and while it is indicated that it will respond in writing to queries from the Tribunal, no witnesses other than Mr. Crellin, whose diary arrangements seem to make his appearance fairly remote, have been provided. None of the officials have been provided, and it would appear that the Tribunal will have to ultimately proceed to make whatever findings are open to it on the basis of the evidence to date. CHAIRMAN: I think it was a Mr. Carl Tully who was the person directly involved as a bank official. The two witnesses who will be giving evidence in relation to Mr. Haughey’s affairs are Ms. Catherine Butler and possibly Mr. John Byrne. CHAIRMAN: Well, before proceeding to evidence, I should make two brief observations. First of all, as is the usual practice in Opening Statements made prior to evidence adduced before the Tribunal, that statement is no more than an outline of the issues to be addressed and the general nature of intended testimony. It is not, in any sense, evidence in itself. The evidence actually tendered may to some limited degree differ from an Opening Statement. It may fall to be tested or be otherwise at variance with what is set forth in an outline. And as I have said on a number of previous occasions, conclusions should not be drawn by anyone on the basis of Opening Statements. They are merely tendered in advance of evidence in the course of assisting the public and other persons present as to what will be dealt with in the course of forthcoming evidence. The only other matter I would mention was, I think, implicit from Opening Statements made earlier in the summer by you and Mr. Coughlan, and that is to the effect that at the conclusion of this phase of the Tribunal’s inquiries, it will be proposed to take up such evidence as is felt relevant that pertains to the actual competition in its various phases in relation to the granting of the second mobile licence; and much of the confidential inquiry work that has been pursued in the course of the recess since our last sittings has been addressed to dealing with and seeking to distill the extremely large volume of documentation that has been presented from various sources to the Tribunal. Very good. We’ll seek to deal with one witness, I think, if possible, before the lunch adjournment.